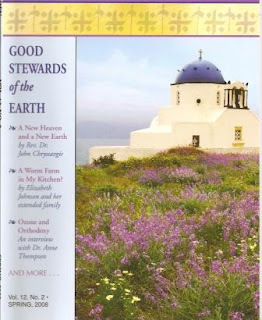 >The Spring 2008 issue of The Handmaiden (A Journal for Women Serving God Within the Orthodox Christian Faith) has as its theme, “Good Stewards of the Earth.” I was drawn to it when it came in the mail for several reasons. · Asceticism (the way we respect creation). The icon restores and reconciles. It reminds us of another way of living and offers a corrective to the culture we have created, which gives value only to the here and now. The icon reveals the inner vision of all….the iconographer struggles to hold together this world and the next, to transfigure this world in light of the next. For, by disconnecting this world from heaven, we have in fact desacralized both…. The icon speaks in this world the language of the age to come…. In this respect, the entire world is an icon, a door opening up to this new reality. What an icon does with matter, the liturgy does with time…. Liturgy, then, is precisely a commemoration of this innate connection between God and people and things. It is a celebration of the sense of communion, a dance of life. When we recognize this interdependence of all persons and all things…then we may begin to resolve the environmental crisis. For then we will have acquired, as St. Isaac the Syrian noted…, “A merciful heart burning with love for all of creation—for humans, birds, beasts, and demons—for all God’s creatures…. We must now learn not to treat even things like mere things, because they, too, contain the very trace of God. Our age is faced with a unique challenge. Never before, in the long history of our planet, has humanity found itself so “developed” that it faces the possible destruction of its own environment and species. Never before in the long history of this earth have the earth’s ecosystems faced almost irreversible damage…. Therefore, our responsibility lies in accepting the need to respond in a unique way in order to meet our obligations. We are treating our planet in an inhumane, godless manner…. There’s a price to pay for our wasting. And this is the value of ascesis; for only a spirit of asceticism can lead to a spirit of gratitude and love….The ascetic is one who is free, uncontrolled by attitudes that abuse the world, characterized by self-restraint, as well as by the ability to say “no” or “enough.”… Without asceticism, none of us is authentically human. I am so busted as I write these words—I almost backed out of posting on this subject once I got started on it, because I am a terrible example of the very words I am espousing here. I waste things. I’m not a good faster. I am a major consumer. My asceticism is wimpy. But we all have to start somewhere, and the articles in this issue of The Handmaiden are pretty convicting. I doubt that many folks will respond as radically to the call as the Johnson family, who write about their personal experience of “going green” in “A Worm Farm in My Kitchen?” But there’s some solid scientific advice in “Ozone & Orthodoxy” by Dr. Anne Thompson, Professor in the Department of Meteorology at Penn State University. Dr. Thompson participated in the climate assessments which were put together by the IPCC (Intergovernmental Panel on Climate change) which won the Nobel Peace Prize last fall with Al Gore. Thompson lives in a certified green building in Maryland, easternvillage.org. I can’t embrace the Handmaiden’s editor’s words in the front of this issue, when she includes “unusually violent weather rip[ping] through our habitats and claim[ing] human lives” among what she calls the evidence of man’s disregard of the earth. Do we really cause violent weather? This is a brief reflection on the response and reaction we as Orthodox Christians might have to the so-called environmental crisis and the movement that attempts to address it. So-called environmental crisis? So, is Deacon Elliott, speaking for “we as Orthodox Christians,” saying there is no environmental crisis, when the Spiritual Advisor to the Ecumenical Patriarch on Environmental Issues (John Chryssavgis) has just written a book to address it? 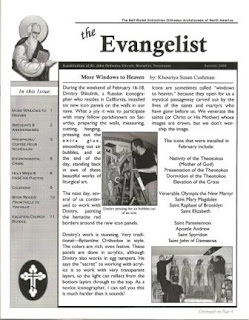 And when the publication which represents over half (the women) of the Orthodox Christians in this country (The Handmaiden) just devoted an issue to it, inviting Chryssavgis to contribute a lead article? One response is to write off any concern for the environment as unnecessary….Another response is to accept the concept that there is indeed an environmental crisis. As caring Christians, we must therefore accept the basic philosophy of this movement and do all that we can to support it as a necessary way to care for and preserve the earth for our own and future generations. Both of these responses, I think, fail to grasp how Orthodox Christians and God-fearing believers before them have viewed this material world around us for thousands of years. All the earth belongs to the King. A good steward using the King’s gifts to help others. If someone takes these gifts by force for himself the King will judege him harshly. If you forget #2 and #3, refer to rule #1. How do we view this world? By living out what this story and Psalm 23 teach. Anything other than this leads us and those around us into environmental crisis. So, if Deacon James believes that an incorrect world view will lead us “into environmental crisis,” it begs the question, are we not there yet? Or does he intend something different in his last sentence from his first, when he referred to the “so-called” environmental crisis? I guess I’m throwing down the gauntlet—I would love to hear from lots of folks on this issue… especially those guys blogging over at Ante-Occidents, and In the Sixth Tone, and The Ochlophobist , and of course Erin over at When We Fast and Caitlyn at The Caitlyncosm and Terry at Wildly Disparate. If you aren’t a blogger and don’t have a Blogger or Google (or other) i.d., it’s easy and only takes a minute to create one: Just click on “Comments” to leave your comment, then follow the simple instructions to register. It’s free and really easy. Can’t wait to hear from everyone. Tomorrow I’m off to Oxford for the final two days of “Camp Square Books” sponsored by Square Books, with my friend, Sue. We’ll be meeting up with Doug and Patti from my writing critique group, and Scott from the Yoknapatawpha Writers Workshop and others for two days of author readings and signings and a fun time hanging out on the Square. Watch for a post this weekend. Meanwhile, I’ll be checking in, hoping for comments!